Today only, while supplies last, get this Ninja Coffee Bar Auto-iQ Programmable Coffee Maker with 6 Brew Sizes for ONLY $99.99 (Retail $199.99)! 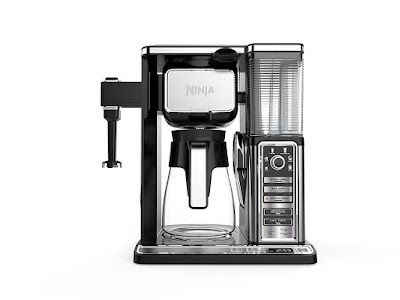 The next-generation Ninja Coffee Bar is a single-serve and glass carafe coffee system—complete with a built-in frother that transforms hot or cold milk into silky-smooth froth in seconds and a host of delicious coffee recipes you can create and enjoy, all from the comfort of home. Pod-free single-serve and carafe brewing allows you to achieve unlimited variety and personal customization of your coffee drinks. Ninja's Advanced Thermal Flavor Extraction Technology allows you to unlock the full flavor potential of your favorite ground coffee and enjoy a great-tasting brew with variable levels of richness. Ninja's Custom brews include Classic, Rich, and Over Ice. Ninja's Signature Brews, Cafe Forte and Specialty, take coffee to the next level. Cafe Forte is a full-bodied cup of coffee that amplifies your coffee's unique nuances down to the last sip. Specialty Brew is a super-rich concentrate that can be combined with frothed milk to create bold, decadent coffeehouse-style drinks—hot or cold, layered or blended.